I wasn’t feeling too brilliant yesterday and so I didn’t work on the blog….or on anything else for that matter. I did however go and get my hair done. This should have made me feel much better I suppose. However…they dyed it the wrong colour and so I am now very unhappy with them to say the least…and with myself for letting them do it, despite my protestations! It isn’t as if I have a lot of it….I keep it very short. Now it’s short and too dark! You’d like to know more about dummy boards. And from the e mails and comments I’ve had, you rather like my ‘dummy board detective stories’. I think I said a while ago that some figures are still in the collections or the houses for which they were made. Some are even still with the same family who either had them made a few centuries ago or acquired them a long while back. 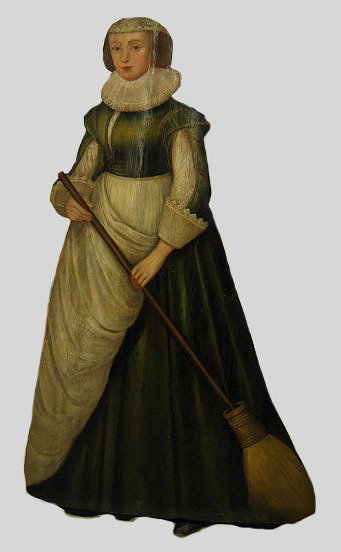 The dummy board that I want to talk about today is an early 17th century figure which is one of those special boards that make up the group I like to call Sweepers. We have met the Saffron Walden Sweeper in another post. Sweeping it all away. This one I like to call the Lullingstone Sweeper. 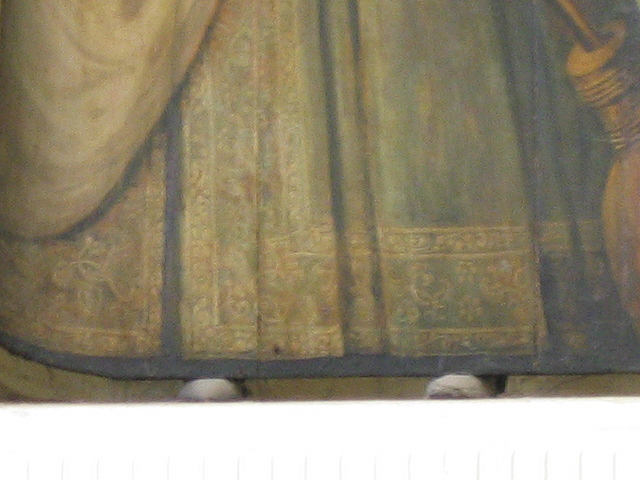 She is a lot older than her mate in the museum and she has been in private hands from the 17th century. She is the figure I use in my sidebar to demonstrate what a dummy board looks like, to newbies to this blog and she is very beautiful. Photos do not do her justice. I first discovered her in a very old 19th century booklet in black and white. She looked stunning even then. It’s a wonderful feeling when you find a dummy board ( or any superb artifact for that matter ) that, after a bit of digging here and there and a few judicious phone calls, exchange of e mails, maybe, or the odd bit of paper on snail mail, you find that, unlike the figure you were searching for last month…. this one is STILL THERE! So off we went to deepest, darkest Kent to have a look. Mr and Mrs Hart Dyke own Lullingstone Castle. It has been there since William the Conqueror hit these shores and before. The family is now in its 20th generation at the Castle! They made us most welcome and were very helpful when it came to examining their dummy board and all the legends that had grown up around her, so we could try to tease out the truth from fiction. 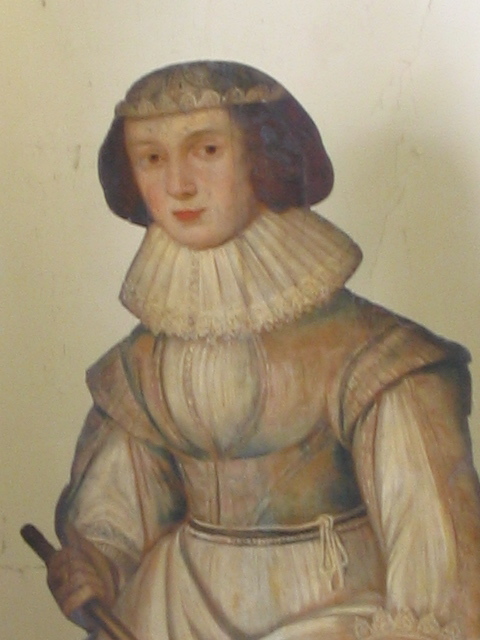 It is said, in family legend, that this figure was painted by Van Dyck the famous court painter to Charles 1st, when he was staying at Lullingstone Castle in the early 17th century. Apparently he fell ill and the young servant girl who nursed him back to health is depicted in this dummy board with her broom as a reward for her endeavours. Why a dummy board, why not a small painting? Why paint her with a broom? Why does she not look like a maidservant? Her clothes are too fine. Why should he bother to paint her at all? We also need to ask…does it look like Van Dyck’s work? The answer to that last question is definitely ..no. It’s a nice tale but common sense tells us that it’s untrue. We have to say that quite a few stories have grown up around these older dummy boards and most of them are just that…stories. We know that there are other figures just like this one ( and when I say just I mean identical) in other collections around the globe. Many of them are right here in Britain and more interestingly, many of them are in the East of England! When we start to dig in the records, we find that many of them started life in Kent and the surrounding area. Now let us examine her costume. 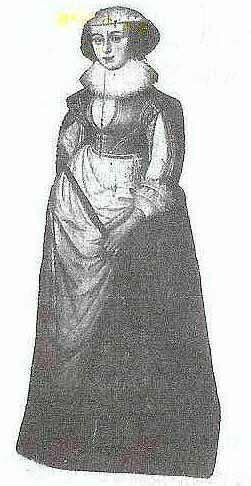 She wears an expensive falling ruff, a tight bodice with capped sleeves and an expensively embroidered skirt and cap. However she has a workaday apron and on her very well manicured hands that have never seen a soap sud, she wears rings. 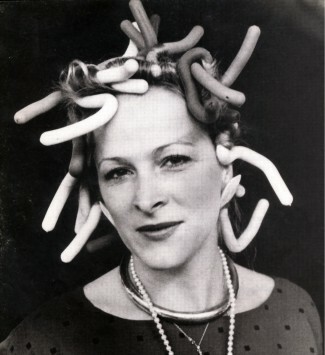 She also sports a series of plaited hair bracelets. The lace she is wearing alone, would have cost more than a whole year’s wages for the housemaid. She has a very fine boned face and seems very elegant, for a servant. The embroidered hem of her dress- identical in pattern to her fellows. 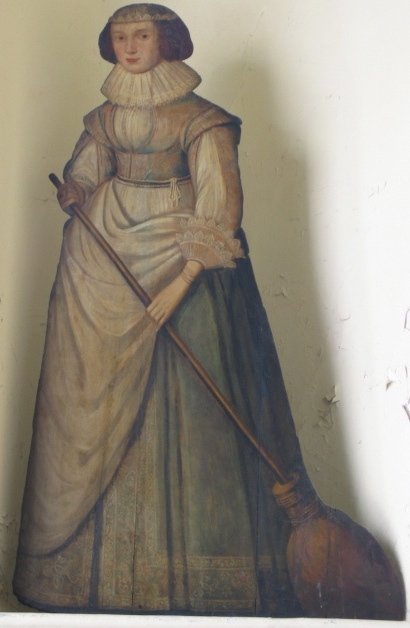 The broom she is holding has a round stock. This means that the bristles are fixed tightly around a pole and are not the usual ‘besom’ that we find at this time ( and still today) which is a flat broom. If we look at pictures of contemporary Dutch interiors,we find quite a few of this type of broom. 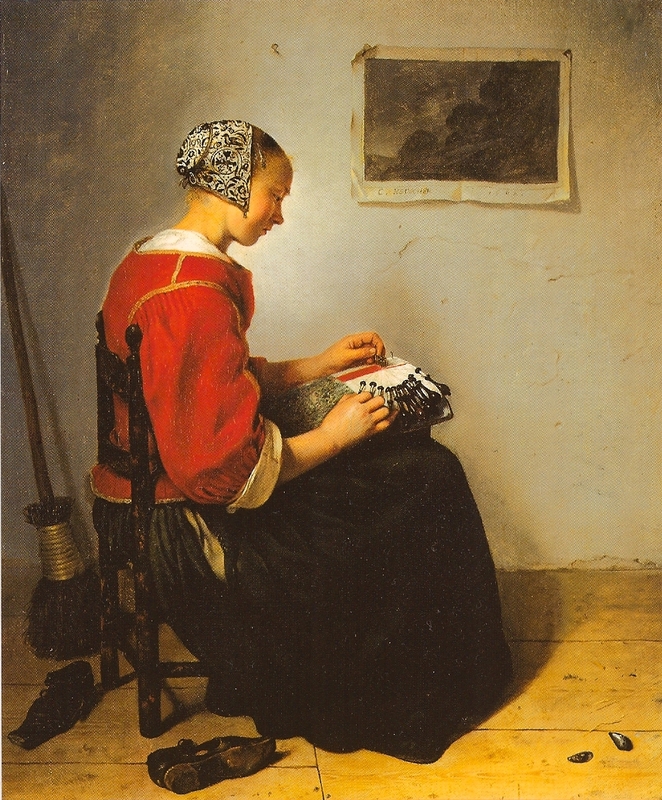 There is even one in our lacemaker picture …which we have used to make a dummy board of a seated girl. We know that dummy boards are originally a Dutch ( or Low Countries) invention back in the early 17th century when this figure was made. We know that she isn’t a later production because she is featured in an inventory of the early 1600’s and was seen by Ned Ward, a 17th century gossip columnist then. So…she is probably, Dutch or, if she was made in this country, at the very least, in the Dutch style. It isn’t too far across the Channel to Holland for her ( or her idea) to travel. Some later Sweepers dummy boards do look like servants, why not this one? What is going on? To answer this question we have to look at the way people organised their lives in the 17th century, the hierarchy, the customs and the etiquette of 17th century life….in Holland, in particular. Ned Ward can help us here! Ned was a pioneer journalist who attempted to chronicle current events, trends and social behaviours in the latter quarter of the 17th, early part of the 18th century. I suppose his rudimentary gossip newspaper, The London Spy, was the ‘Hello magazine’ of its day- perhaps amalgamated with “Private Eye’. He certainly lambasted the prominently fashionable folk of the age but he also had an eye for the minutiae of 18th century daily life, for the interesting fact and the titillating tale. So he seems to be saying that they were depictions of generalised mistresses of a house which could be set up at strategic places all over the home, on staircases and in halls, to keep the servants in order. Many hours scrabbling around in dusty old bits of paper pays off then! I am at two fairs this weekend and so won’t have the time to blog. See you all next week. This entry was posted on 16/04/2010 at 9:43 am and is filed under 1. You can follow any responses to this entry through the RSS 2.0 feed. You can leave a response, or trackback from your own site. Wouldn’t it be great to be able to travel back in time and find out exactly who she was or what tales she could tell if only she could speak. I think that about a lot of the dummy boards I see Debbie. There are so very few who have names…. it’s a shame. But you’re right, several dummy boards of the same person’s face deserves a name and a history don’t you think?